There will be a very close conjunction of Jupiter and Venus tomorrow night. They’ve been quite close for a couple weeks, as you might have noticed. The sky chart above, rendered by Cartes du Ciel (my planetarium app) shows the dots for Jupiter and Venus overlapping, but they separate when I zoom in. To your eyes, they will not appear to overlap. Still, seeing the two brightest planets so close to each other will be well worth a trip outside. Closest approach will be 0.3° (about two-thirds the diameter of the Full Moon). The ideal way to view this conjunction is through a telescope and eyepiece combination that provides around 120X magnification. The magnification (M) depends on the focal lengths of the telescope (FL1) and eyepiece (FL2) used. The formula is: M = FL1/FL2. For example, my Takahashi refractor has a focal length of 1040 mm. Using my 10 mm Plossl eyepiece, I’ll get (1040 mm)/(10 mm) = 104X magnification. That’s not quite ideal, but it’s the closest I can come to the maximum magnification that fits both planets in the same field of view (FOV). Click the thumbnail below to see the ideal 120X view. The view in that thumbnail is another simulation by Cartes du Ciel. It accurately shows the positions of Jupiter’s moons, the 4 largest of which can be seen with binoculars. Only 3 of those moons will be visible on June 30, as Ganymede will be behind Jupiter for most of the night. The disc of Jupiter is rendered with its typical banded appearance. The simulation also accurately recreates the waning gibbous phase of Venus on that date. Venus was at greatest eastern elongation on June 6. Its phase will reach “new” on August 15, when Venus passes between the Earth and Sun. To watch a simulation of the Venus phase cycle, see my Oct 28, 2013 post. My 10 mm eyepiece provides an FOV of 0.45° at a magnification of 104X, so the planets will appear about 25% smaller than in the thumbnail, but I’ll give it try for this event. Both planets are bright, so I’ll be able to use shorter exposures. Shorter exposures mean less sensitivity to vibration and atmospheric refraction. Bracketing the exposure times over a wide range is SOP. Astrophotography almost always requires experimentation to get the best image. In addition, I’ll use what is called “mirror lock-up mode” on my Canon EOS 20D. This prevents vibrations that could blur an otherwise good image. All DSLRs these days include lock-up mode as an option somewhere in their settings menu. The planets will be elevated about 34° above the horizon just after sunset, and will set about 2 hours later. Even in the glow of dusk, they’ll be bright enough to spot. 34° isn’t bad, but the lower the planets drop, the fuzzier the view through the atmosphere. So there’s a “sweet spot” that best compromises contrast and clarity. Interestingly, both Jupiter and Venus will show discs of approximately the same size. 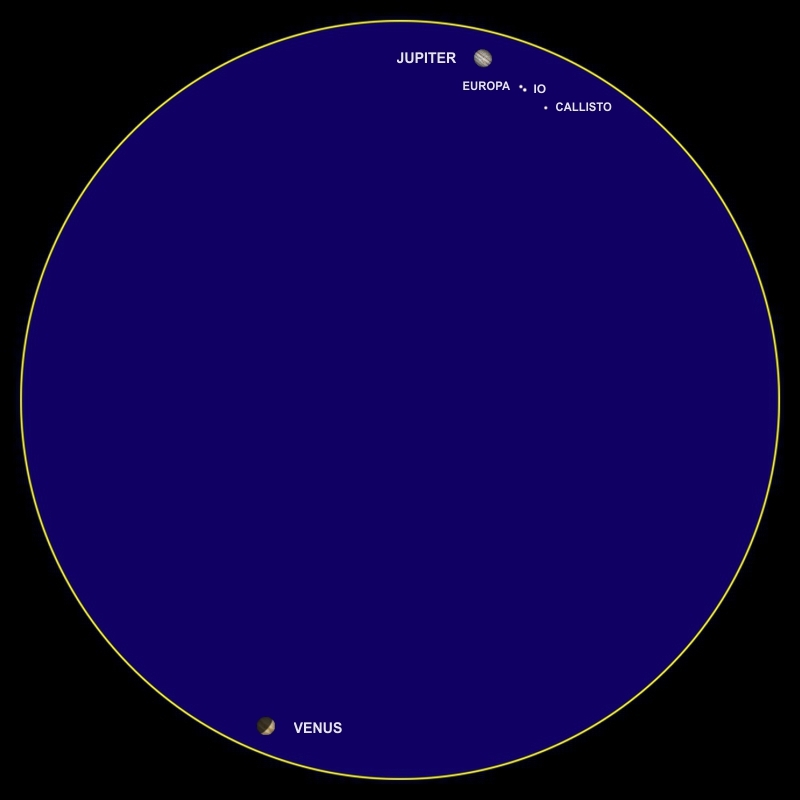 Jupiter’s disc will have a diameter of 32.5″ (arcseconds), and Venus will be at 31.9″. Although Jupiter is intrinsically large than Venus by a factor of 11.8 (142,984 km diameter / 12,104 km diameter), Jupiter will also be about 11.8 times farther away. Hence the similarity in apparent size. By comparison, the Full Moon has a diameter of around 1800″ (0.5°). To the naked eye, Jupiter and Venus will appear both close and bright. You can’t miss them. Venus is currently the brightest object in the west after sunset, shining with a magnitude of -4.4. 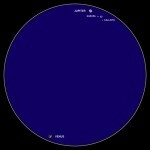 That’s 15 times brighter than magnitude -1.46 Sirius, the brightest star in the sky. 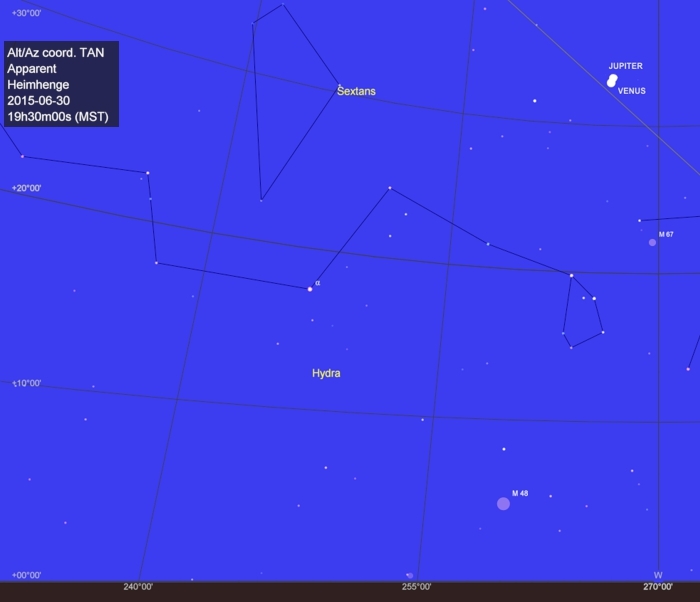 Jupiter will be just above Venus, shining at magnitude -1.8. If you have binoculars, you’ll see the pair even more easily, as well as 3 of Jupiter’s moons. If you have a telescope, and choose your eyepiece wisely, you can get a view like that simulated in the thumbnail. No need to do the calculations for FOV. If the eyepiece can (just) fit the entire Moon in the view, that’s a good eyepiece to start with. This will be one of those rare close conjunctions when you can see two planets at the same time in the same FOV at high magnification. That’s why I’ll be trying to get a photograph. If you don’t have a scope, no worries. Just using your eyes, this will be a spectacle worth seeing. Carpe Nocte!